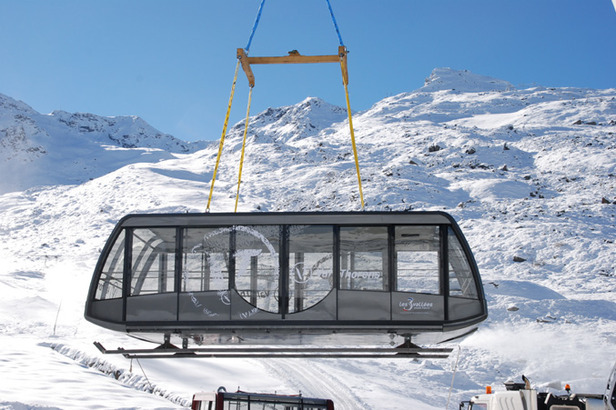 It was a major operation getting the cabins to the highest ski resort in Europe from the factory where they were built in Switzerland, not helped by all the snow. A special sledge was used, towed behind two trail groomers, to move the cabins over snow once they arrived. The two cabins have the same capacity as those they replace, among the world's largest, able to carry 150 people each. Weighing in at 22 tonnes each, they represent an investment of 700,000 Euros. The cabins lift skiers and boarders to the very top of the world's largest ski areas, the 3 Valleys, at 3,200m. They're due to go in to service this weekend.